On the equator and deep in the vast Indian Ocean lies a captivating group of over 1,190 coral islands – the Maldives. None of the islands have mountains or rivers, and the islands are merely two meters above sea level, making them the world’s lowest country in elevation. In 2004, a tsunami swallowed two-thirds of the country. As a result, over 20 islands were permanently erased from the map. The Earth is currently undergoing a climate change of historic proportion, with sea levels rising noticeably from the melting of glaciers and icebergs. If the trend continues, the Maldives will be completely submerged in 30 years. One should start planning soon as the Maldives is disappearing under the ocean. The islands were formed from underwater volcanic eruptions. The year-round warm weather, endless white beaches and inviting water make the Maldives an exotic and scenic paradise on Earth, and a perfect getaway for vacationers and honeymooners. According to the International School Network, 80% of the tourists are for romantic getaways. Around 80 islands are major tourist attractions. A single resort operates each tourist island, and each island is not big. Therefore, providing a quiet and private spot sought after by the newlyweds. Though it is a desirable place to visit, its resort fees do not come cheap. If you go there during May to October, the low season, you can snag great deal information at tripadvisor.com. The low season is also a raining season brought on by the monsoon, but it rains only for a short period. When you arrive at Malé International Airport, the nation’s main gateway, you can take a public ferry, a speedboat, or a seaplane to go to the island you are staying. Speedboat transfer is for resorts closer to the airport, and the fees are lower. It costs much more to travel by a seaplane to islands far away from Malé airport. My sisters and I have enjoyed traveling since I was little, and we are budget globetrotters. Last summer we visited the Maldives and stayed in a more modest resort closer to the airport – Adaaran Club Rannalhi – on the South Malé Atoll. 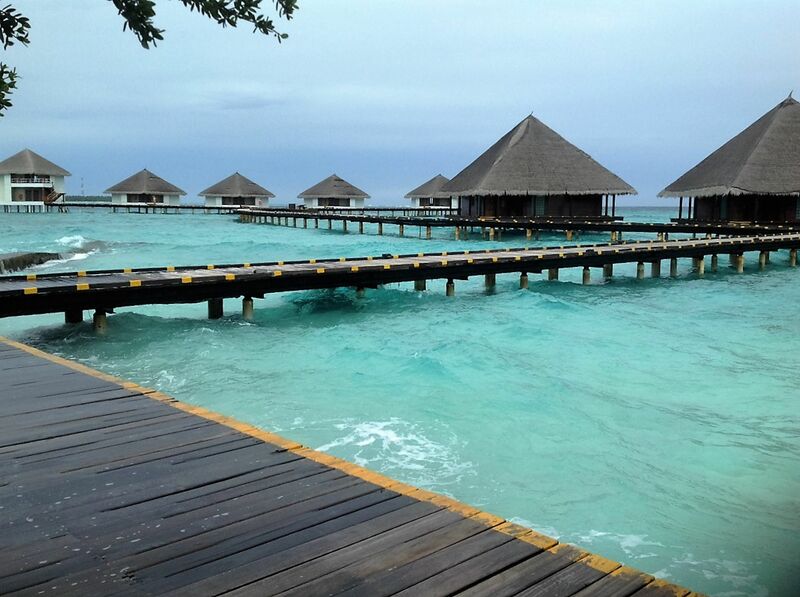 We stayed in a water bungalow, and when I opened my eyes the next morning, I saw the vast Indian Ocean. It felt like I was sleeping in the ocean. As the sun rose, the ocean color magically transitioned from emerald-green, light blue to deep blue. The sky and the ocean blended into each other, and it felt like I was in another world. Snorkeling is another activity you can do here. Have fun exploring colorful fish! The bungalow has a balcony in the back where we jumped directly into the ocean and snorkeled. Surrounded by the tropical fish and corals, it was an amazing scenery. Other activities for tourists include sailing, windsurfing, jet skiing, and canoeing. While many of these water activities are common in beach resorts around the world, the Maldives is very quiet and peaceful. It is a retreat from the world. The Maldives is also the perfect place to windsurf! Although each resort is isolated geographically, Wi-Fi is available for you to instantly share your incredible experience with friends and family. In 2012, the Maldivian government stated that they intend to purchase islands in Australia, Sri Lanka or India to relocate their people in the event the Maldives is no longer habitable. Global warming is an urgent problem that needs to be remedied immediately. I don’t know what will happen to the Maldives in the future, but the prospect looks dim. Hopefully, countries will take drastic measures to prevent climate change from sinking the Maldives. In the end, we don’t want an Atlantis: The Lost Empire to come to life. The author may intend well – but the Maldives are not expected to go under in 30 years – perhaps never. goodness they’ve survived as sea level rose more than 400 feet during the past 12,000 years. The Earth is not currently experiencing any sort of dramatic climate change. The rate of sea level rise has not accelerated since the consensus view of when man-made global warming is believed to have begun adding to naturally occurring warming (1950-1970’s). Here’s an interesting read for Ms Chang. Will Pacific Island Nations Disappear as Seas Rise? Maybe Not – Reef islands can grow and change shape as sediments shift, studies show. National Geographic Society just released its December 2015/January 2016 Traveler issue, and in it one of the articles entitled “As the World Sinks” timely discussed the present subject (http://travel.nationalgeographic.com/travel/traveler-magazine/tales-from-the-frontier/maldives/). While NGS does not provide argument for the disappearing of Maldives, the publishing of the story serves as a loud reminder of the reality we are facing from global warming. The first sentence in the article says it all: “The Maldives are disappearing into the ocean”, and the rest explains that the Maldivian government will make this country carbon-emissive free to prevent the country from being “wiped off the map.” Maybe the Maldives will not sink so fast if the world does its part in becoming more eco-friendly. When you say global warming, are you thinking AGW – some additional warming in addition to what is expected to be occurring naturally? Or, do you just lump it all together. This matters when proposing that man should try to do something about it. Note – the Maldives are not sinking. Sea level is rising. One wonders, Miranda, are you of the incorrect belief that scientists believe that all most to all sea level rise is from anthropocentric global warming? Notes. AGW, as I noted – consensus is that it potentially became observable sometime between around 1950-1970’s – not before. After that – the debate is about how much of the warming since then has a human footprint on it – not a soul would suggest all of it. ‘ The natives observe the atolls to be wasting away; in some the coconut trees are standing in the water ; in another the black soil of the island is discernible at low water thirty feet from the beach ; the south-east side of an island in Phaidee Pholo Atoll is entirely gone, but is marked by a banyan tree in the water. They say that some islands have disappeared entirely and instance near the island Wardoo a rocky shoal, which (they say) was once an island in Atoll-Milla-Dou. These stories persist long before 1950 – and continue. History is our friend – we should learn – not our enemy. Take a look at Male : https://www.google.com/?gws_rd=ssl#q=male+maldives. Now if you go and ignore history and build a hard metropolis on a sand bar — you’re going to be a nature’s mercy. However, generally, in the Maldives as with other coral reef based island chains around the world – coral growth will keep up with sea level rise. Man will have to figure out how to protect Male, however. In some parts of the world, as in some of the coral Pacific island chains – the islands have actually been gaining land during the 20th century. There is also much debate about whether or not there has been an acceleration of sea level rise since the birth of AGW. NOAA’s long tide record clearly says absolutely not – and puts the current rate at just about 7 in/ 100 yrs. NASA’s newer effort at attempting to use satellites to measure it is fraught full of problems (tides, waves, ocean slosh, and varying gravitational effects). A recent NOAA reanalysis of the satellite data, as did a few independent studies, found that sea level rise actually slowed to just over a 5 in/100 years clip from 2005-2012. NASA’s is still holding that there’s been some acceleration – but the proven global tide gauges will have none of it. Check out http://tidesandcurrents.noaa.gov/sltrends/sltrends.html. A great guide. You can slide the location map to the east untii you see the southern tip of India. The Maldives are to the SSE. There is limited long -term tide gauge data, for the Maldives, but check out the 3-4 sites around the south of India – not so far away. Click on the green arrow – then click on the linear trend chart which will open up. We’re looking at an area of the globe where relative sea level rise has between a 2 and 6 1/2 in/ 100 year trend over the last 100 yrs or so. Consider – the Earth does not have to warm any more for sea level to continue to rise at about the current rate — simply stay this warm – – much like it was about 1,000 years ago, when the world’s glaciers had retreated much further than today – and for a longer period of time, before their advance began once again starting in the 1,250-1,350AD period (continuing until the Little Ice Age ended – early 1800’s ish). Male is one of the most densely populate pieces of real estate in the world. It was not good planning. I appreciate your standpoint, and happy to see this important issue being discussed. Sure, the islands are not sinking and it is the sea level that is rising. I’m pretty certain that the NGS author knows this, but chooses to express the submerging of the islands more figuratively. It seems a bit argumentative to criticize that. Would you say it is wrong when people say that the sun rises in the morning, when in fact it is the earth rotating? The risk for the Maldives to be underwater is high as a result of climate change due to human activities, which is the prevailing view. Why not do more to slow down the carbon emission to alleviate the problem, even if it is simply a “risk”? Is the cost for doing so that great? You may not agree to it, and I’m totally okey with it. After all, reasonable people disagree all the time. Even in the face of the same set of facts, people draw different conclusions. Isn’t that what sciences are all about? That was a great analogy “the rising sun.” And yes – absolutely – reasonable people disagree all the time. Unreasonably folks out there – Senators – media – etc., are calling for some of out most brilliant scientists and others, who are simply skeptical of the wildest claims, to be charged with crimes. Some are saying charged with crimes against humanity. Folks like Judith Curry – check out her resume: http://curry.eas.gatech.edu/onlinepapers.html (she is really a sweetheart, in addition to being brilliant). Did you read the news piece from 1837? And consider how much sea level has risen over the past 12,000 years. That’s really all recent history. Once again – the view from the man-made Global Warming, AGW, folks is that there’s really nothing of note here being added to the natural warming process until the 1950, or 1970’s. Now – the satellites are very clear – there’s been no additional warming of note, during the last 18 1/2 years . . some data suggesting 23 years. Since AGW is believed to have begun, the Earth has only experienced some 22-25 years of significant warming; which is almost identical to the warming stretch leading up to the late 1940’s (we then cooled slightly until the 19970’s). Sea level is rising no more quickly after 1950, then it was prior to that. Yes – it is possible (predicted – not found) that a fraction of of that sea level rise has a human footprint on it – but Ii doubt very much that any scientist would actually hang his hat on it and actually state “most of it.” And, with so many studies finding that the rate has actually decelerated in recent years, combined with October’s massive study out of NASA which found that Antarctica has been gaining ice mass, and not contributing to global sea level rise, I’m even more confident that most if not all of the sea level rise – which continues to plug along – is naturally occurring.I’d be very surprised if anyone can actually show that man contributed to the last inch of rise, out of the last 400+ feet of sea level rise. I’ve always been greenie sort. Still would prefer to live out in a Tee Pee, naturally. Cleaning up the environment – reducing pollution – stopping population growth – and working our way to a more sustainable environment, inc cleaner energy, are all extremely necessary goals. However, nothing we can do will change the rate of sea level rise by an inch/100 years. We’ve best remember that horrific storms come and go (and, there’s been no global increase in extreme weather, extreme drought, area of the Earth in drought, or floods, since 1950, as compared to the period prior to) and we should prepare for them. Hurricane Betsy in 1965 did not result in adequate preparation for Katrina in 2005. The great New England hurricane of 1938 (dwarfed Sandy) was forgotten and New Jersey and New York had not prepared for it. Here: http://www.weather.gov/okx/1938HurricaneHome. Sadly – our national media refused to even remind us of this for fear that we stop and realize that these are naturally occurring event, while they want to promote fear and the view that man must have caused it to happen. Gov Cuomo of NY, even had the audacity to stand up and say that before we built New York, the area didn’t even have floods and hurricanes. The LAT’s simply quoted him – without questioning what an outrageous, political, and dangerous lie such rhetoric is. Protect the cities from nature’s powerful fury – stop promoting that we can simply change nature. Get your head out of the sand. Wakeup. Umm… where have you been for the past 30 years? Global warming exists. There is proof of it everywhere. Research yourself and if you do listen to the news, or people talking on it, follow up and research to see if that’s the truth. Coral reefs in many parts of the world are dying. This has started in the Maldives. So saying that coral will grow and build up is just not true. I go along with GaryH845. Rather than take from the concensus we must always question what is being taught and where it comes from. First it was Global Warming and because that wasn’t having the desired effect then it became Climate Change. Have you heard of Agenda21? Time to get an education. 2 years later the islands are still afloat and ridiculously expensive. Available only to the very rich… often $1000 a night…and the very Islamic rich. No drink in sight. Should they submerge, so the f*ck what. But I’m betting NG gets this wrong as do the global warming activists. Here’s a thought. Fill a glass to the brim with ice water. Watch it melt. Did it lower or rise? It works the same for the oceans. Hi Tensace, you forget about the fact that water expands when the temperature rises and with the increase of water temperature coral bleaching happens. Everyone is entitled to their own opinion and I do believe that sea level rise is real and most people choose not to believe it because they believe it will not happen in their life time. Not a logical analogy. Much of the melting ice is outside of the current liquid H2O, so it will add volume as it melts and flows in…..
Alcohol is available to all the resorts. Do your research! 30 years huh… I’ve got to buy a boat or something. Sometimes the madness that is the future is really amazing. Back in the olden days this was called false prophesying. It could get you killed. Science is ever changing. What is considered absolute truth today is something totally different tomorrow. The world is coming to an end but it is not because of global warming. We won’t live that long. Evil people bring about evil endings. Isn’t it odd that that SAME 30 year prediction of doom was declared in 1988? Yet many of the islands have increased land mass… coral growth and sediment deposits can do that… and have actually maintained that 50 year old “typical 8 feet” of height above sea level? Unless you are making your income for selective study grants, you can look at historic information and not buy into the hype for a check. But Chicken Little WILL one day be right. I think we should listen to the scientists and the reports of the IPCC. The Intergovernmental Panel on Climate Change is an intergovernmental body of the United Nations, dedicated to providing the world with an objective, scientific view of climate change and its political and economic impacts, producing reports which have the agreement of leading climate scientists and the consensus of participating governments. The fifth assessment report, AR5, is the most comprehensive synthesis to date. Experts from more than 80 countries contributed to this assessment, which represents six years of work. More than 830 lead authors and review editors drew on the work of over 1000 contributors. About 2,000 expert reviewers provided over 140,000 review comments. The IPCC’s technical reports derive their credibility principally from an extensive, transparent, and iterative peer review process that is considered far more exhaustive than that associated with a single peer-reviewed publication in a scientific journal. They are telling us we have just 12 years to make massive and unprecedented changes to global energy infrastructure to limit global warming to moderate levels. Staying at or below 1.5°C requires slashing global greenhouse gas emissions 45 percent below 2010 levels by 2030 and reaching net zero by 2050. Meeting this goal demands extraordinary transitions in transportation; in energy, land, and building infrastructure; and in industrial systems. It means reducing our current coal consumption by one-third. It also demands a vast scale-up of emerging technologies, such as those that remove carbon dioxide directly from the air. All in the very narrow window of the next 12 years while our momentum pushes us in the wrong direction. IT’S TIME WE STARTED TO LISTEN. Taking care of our planet is surely admirable. Some naively claim the need to eliminate most carbon emissions from various sources. If we were able to do that, the celebrations begin and people will starve from lack of or minimizing vegetation. Guess what? The trees (and all greens & ocean life) would suffocate. Guess what vegetation breathes? Yes – vegetation inhales carbon dioxide and exhales (CO2 OXYGEN..!!) Funny how humans do just the opposite, huh? The magic of Creation! The remaining portion of unburnt fuels (CO carbon monoxide) is being addressed for clean burning, but the bottom line is this…ALL (3rd world) developing countries produce most of the CO of the Earth. The Tree Huggers try to place blame on the USA when in actuality it is the cleanest country on the Planet and improving by the minute. It is the CO that needs to be eliminated…and with newer techno, it is being done. The 3rd world wants a free ride and those who profit from organizing the Rebels are not helping…their result is confusing and raising $$$. Ever think that when an electric vehicle etc. is charging, it is using a variety of fossil fuels? The solution is not reverting to the Stone Age. One country cannot do it all . Save our Planet. In 1989 AP put out a report by the United Nations Environmental officials saying the Maldives would be underwater by 2000 if climate change does not reverse. Well… here we are 2019 and the Maldives is still there.